cargo train car transporter 3D is the best parking game of itskind. you have the chance to drive many different kind of cars likaa pickup truck , police car , taxi , coupe . you need to drive thecars to the correct location on the train with out hitting anyobjects or drive from the train to the ground or in a buildingevery vehicle is unique can you handle every car. ?taxi vehicle :every been in a taxi if not then here is your chance to drive oneof the most beautiful taxi's there is.your job as a taxi driver canbe very excited you never know, what you will see the moment youstart working as a taxi driver.but before you are allowed to workyou first need to get your licence and here is the chance for youstart driving a taxi and learn how to park your taxi and drivethrough the city without hitting any vehicle's that drive aroundand make sure you keep your fuel as full as possiblepolice car : doyou like driving around fast and to ignore rules sometimes thenbecoming a police man is perfect for you. in this game you candrive around in a police car and learn how to park your vehiclewithout hitting any cars or containers that are around you.a policecar drives nice and smooth has awesome lights on the roof and hasenough speed to win a street race with.pick up truck : are youready to drive a big truck. then download this game now because ithas a very big truck special for people that love pick up truckvehicle's but remember with big vehicle's comes big responsibilityit has alote of weight and power it could destroy many thingwithout any problems but after driving it a couple of times parkingyour pick up truck wont be that tricky anymorecargo train cartransporter 3D features: - amazingly realistic driving game- youare able to drive many cars ( pickup truck , police car , taxi ,coupe )- 15 amazingly realistic parking situations- Show off yourskills- Choose out of many roads to drivewe hope you will enjoythis amazing real simulator driving game aand give us some love byliking our MobilePlus facebook page so we can keep you up to dateon our latest games! Buckle up! Start your engine and hit the gas paddle as MonsterTruck Demolition War in derby arena is here to revolutionize themonster car destruction & road rampage. Xtreme stunts and bigramp car whirlpool demolition racing game. Monster truck derbygames have never felt so adventurous. Play your favoritedestruction derby games.Miami Game Studio welcomes you to new 2017adventure by playing derby xtreme game where the race war is goingon with bumper cars that are weaponized with missiles, combatracing skills and monster derby jack. In this demo derby cardemolish the monster bumper cars by shooting and hitting them hardwith your monster cars. Xtreme Car racing and truck destruction iswaiting for you in the monster ramp car derby demolition arena.This is the ultimate knock out racing in monster racing war is notthat easy as minnow bumper racing cars in speedway derby with ourMonster Truck Demolition War: the ultimate road rampage in demoderby arena. Hit for realistic car crash and destruction rivals. InDerby demolition derby monster car smash game you need to destroyor damage other monster trucks and cars.Demolition derby 2017 getsan edge over your opponents in derby car race by trying to bumpthem off the track. In Death car reckless racing don’t lose yourbalance and be the first to fall. Become the reckless racing legendon rough bumps will lie in your way. There is big truck destructionto banger racers while cars battle with monster truck derby gamesof 2017. Let’s start the destruction derby madness in deadlyoffroad race and forget about the mainstream highway getaway carcrash and road rampage as you sit behind the monster truck wheels.Real demolition war offers you the ultimate thrill to wreck othercars in roughly death race with real speedway deadly destructionand truck demolition mania. Xtreme demolition derby with furiousdriving and racing to recklessness with the extra feature ofmonster car war will throw long range missiles to the racing rivalsthat will harm cars or trucks for quick destruction. Destroy otherramp cars! this derby destruction game is going to bring you allthe thrill of carnage.Mad Truck Demolition Arena War Features:✓Daring wrecking high speed racing with real demolition action.✓Thrilling monster destruction derby racing experience. ✓ Absolutetreat for the lovers of truck car destruction, deformation and realdamage. ✓ Xtreme stunts with crazy driving in demo derby games forfree. ✓ Big American muscle cars and monster trucks for hugedestruction. ✓ Every monster vehicle has guided weapons and armedmissile. Folks! Play this demolition derby arena battle withMonster Truck Demolition War with adventures car crashing of 2017and real monster truck war & destruction derby experience. Bringing the family-friendly entertainment of live Monster Jam®events straight to your tablet or mobile phone all year round,Monster Jam is an authentic and dynamic mobile gaming experience!Monster Jam® will not only allow you to relive your favouriteMonster Jam® moments but to create your own memorable monster truckstunts using all the biggest names in Monster Jam®, including GraveDigger®, El Toro Loco®, Maximum Destruction® and Monster Mutt®!Smash through barriers in actual Monster Jam® events and races, orfreestyle through unique environments and hill climbs!- 24fan-favourite licensed Monster Jam® Trucks recreated inbreathtaking detail!- Classic Monster Jam® Arenas to compete in,including Anaheim, Georgia, Houston and Las Vegas!- Experience newcontent every month when updates bring more trucks, newenvironments and extra game modes!- Unique and distinctive gamemodes including racing, destruction, jump stunts, towingcompetitions and freestyle!- Convincingly accurate 3D physicssimulation! Are you in this delightful follow-up? Be the king of the high-speedmonster truck racing. The world’s best heavy truck drivers can testtheir driving skills in treacherous roads and tracks. Endure adisciplinary distance from police cars so you do not get busted bycops. Feel the adrenaline rush and beat the police. Test youroffset skills while driving these crazy monster truck. This amazingracing pursuit will not just test your monster truck driving skillsbut will also test your police escape plan. Delight yourself bydownloading this epic warfare and get your exhilarating chance totest your driving skills to the maximum. Enjoy this amusingcompetition.Giant Roaring Monster - Formula Car and Flatfoot GamesFeatures-Highlights:4x4 amazing Truck, Monster Car and Crazy truckcar.Race 8 high-speed formula cars.Stunning HD graphics, realisticsounds and animations.Perform stunts and jumps with huge ramps.Whatare you waiting for? Giant Roaring Monster - Formula Car andFlatfoot; game on your android smartphone or tablet and enjoy it.Weare always striving to provide the best user experience for ourplayers. We are also looking for your feedback, suggestion orrecommendation. Please, feel free to let us hear from you at"[email protected] " so we can continue to bring you thebest experiences and updates. Get ready for funny and animated monster trucks race for kids. Getbehind monster wheels and show off your best driving skills.DESIGNED FOR KIDS Game has big buttons, simple and friendly gamecontrols! Helps to understand the educational mechanics of usingmobile devices as smartphones and tablets. MASTER DRIVING SKILLSDrive on thrilling hill climbing tracks, moving constructions,muddy swamps and water lakes. Overcome various obstacles and trickyterrain, perform cool stunts, high jumps and flips. ADVENTUROUSRACING WORLD Race in 2 awesome worlds: Monster Truck Town and BeastCars Valley. Complete 24 full of adventure truck racing levels.Find different paths to the finish line with several secret roomsfull of coins! ENTERTAINING GAME Enjoy dynamic gameplay, cartoonatmosphere, awesome slow motion effects, cool animations, realisticphysics-based monster truck driving experience and beautiful viewswhile racing on these crazy monster wheels! This game will surelykeep you or your little fella entertained to the max! It is allabout to get crazy in this extreme powerful truck race! Airport Show is an exclusive stunt driving event and you’ve beeninvited to take part! Welcome to the high stakes, high-octanedriving competition for the fiercest drivers! The biggest monstertrucks need only apply!FEATURES:▶ UNIQUE STUNT ARENA: Drive aroundan old airport!▶ AWESOME MONSTER TRUCKS: Each vehicle handlesdifferently▶ 70 MISSIONS TO COMPLETE: Drive, do tricks, beatrecords▶ FREE ROAMING MODE: Explore the area at your own paceTakingplace in an airport that’s been repurposed as an obstacle coursefor giant monster trucks, Monster Truck Airport Show will test yourdriving skills unlike anything you’ve seen before! Pick one of theamazing, unbelievably huge trucks available and show that you’vegot what it takes to drive them! This is the ultimate, extreme testfor the most proficient drivers! Do you have what it takes to takepart and pass it with flying colours?Before you prove your worth asa driver, you will need to familiarize yourself with a variedselection of giant, big-wheel monster trucks. There are sports carsturned into monster trucks, a monster truck pickup, even a monstertruck bus!Discover all of them and you may find some surprises too!You will take all of those monster trucks onto the arena and usethem to beat speed records, perform amazing stunt tricks, evendrive across smaller cars parked around! Who’s going to stopyou?Depending on the vehicle of your choosing, you will getmultiple missions of varying difficulty to complete. You will haveto dodge obstacles, use ramps for long distance jumps, drive overcars & tree logs and more! Don’t take your eyes off the roadPerform mind-blowing tricks, test your reflexes, become a masterstunt driver!There isn’t much that can compare to the power of aspeeding monster truck, but that doesn’t mean you can be reckless!Drive safely and carefully and you will surely make it to the endin one piece. If you go a little too wild and crash though, don’tworry. If you make a mistake along the way you can always use arewind system to correct it without restarting the level fromscratch. If your kids love all things monster trucks, Then they will lovethis game! Monster Trucks racing game for young kids and toddlers!Designed for young Children and toddlers between ages 2 to 8 yearsold, Simple controls to drive the monster trucks along the course.the truck never flips ensuring your child always gets to the finishline! Race against other trucks, Which slow down when they areahead, to give your child the best chance of winning each race! Funbig buttons to Jump, Beep the horn and change the music track forlots of fun sounds. Crush the cars along the course with themonster machines, Collect stars, Fireworks and balloon popping areat the end of each level to give more excitement to the kidsplaying. There is 4 mini games included. Balloon Pop Memory CardsPuzzles Coloring pages With 15 cool looking monster trucks across42 levels to blaze across, will create hours of fun for yourtoddlers. 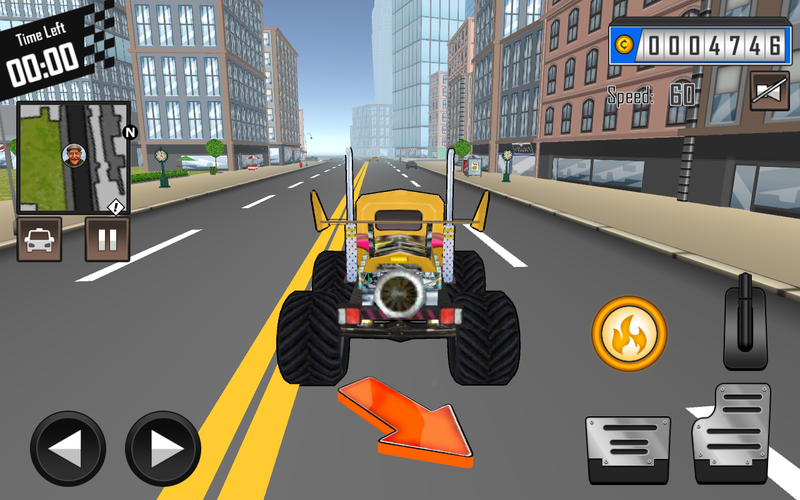 Monster Trucks Kids Game helps your child understand theeducational mechanics of using mobile and tablet devices. withpuzzles, memory card and heaps of fun racing action. Features: * 15Monster Trucks to choose from * 42 Levels to play * Fun Cartoon HDgraphics * 5 different kids music sound tracks for the child toswitch between. * Cute Monster trucks, engines, horns + much morevibrant sounds * Balloon pop game & Fireworks at the end ofeach race. * Mini Games such as Puzzles, Coloring pages, MemoryCards & Balloon Pop + much more. Privacy Information: Asparents ourselves, Razmobi takes children's privacy and protectionvery seriously. We do not collect any personal data. This app doescontain advertising as that allows us to give you the game for free– ads are carefully placed so kids are least likely to accidentallyclick on them. and ads get removed on the actual race screen. Thisapp includes the option for adults to unlock or buy additionalin-game items with real money to enhance game play and removingads. You may disable in-app purchases by adjusting your devicesettings. If you're having any problems with this app, or wouldlike any updates/enhancements, feel free to contact us [email protected] We would love to hear from you as we arecommitted to updating all our games and apps for the best possibleuser experience. 3D Grand Monster Truck Stunts Driver Play one of the bestimpossible monster truck games. Drive your monster truck on highramp tracks. Are you ready to play this amazing real monster truckimpossible track game 2017? If yes then you're in the rightdirection. You will drive your monster truck on different zigzagsky high impossible ramp tracks. In this modern monster truck stuntimpossible track game, you will drive your expert monster truck 3don big ramp tracks that touch the sky. These crazy impossiblemonster games will give you sky high entertainment with itsappealing graphics. In this extreme impossible tracks 3d monstertruck freestyle game, we will give you different zig-zag rampsimpossible tracks on big height sky. You will drive multiplemonster trucks on different impossible tracks. These modern monstertruck stunt games 2017 will give you a chance to drive on curvy anddifficult ramp tracks in high sky entertainment. In the pasthistory, you would have played many expert real monster truck racegames and these best new impossible monster truck games are bestfor you. We will give you realistic game play environment with itsstunning impossible tracks that are sky high. In these modernimpossible driving games, show your best real monster trucksimulator 2017 skills and take a ride on different zig zag uphilloffroad mountain impossible tracks. In this 3d grand monster truckstunts driver game your duty is to accept difficult off-roadchallenges and take a ride on different awesome real sky highimpossible monster truck stunts track. In this crazy monster busfree game, we will give you realistic game play atmosphere with itsstunning dangerous and difficult ramp tracks. In this crazy newmonster hero city battle 3d game, we will give you multiplethrilling levels. In these expert impossible tracks truck games,every level becomes more attractive and dangerous because of bigheight sky high ramp tracks. Initial levels are easy to play butgradually upcoming levels are more difficult to play. These crazynew monster truck stunt games 2017 will give you limited time tocomplete your level. 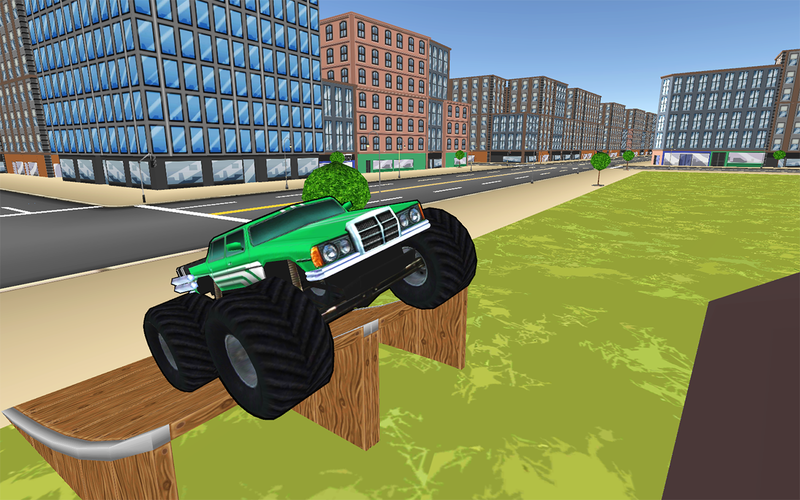 In this real monster truck stunt tracks 3dgame, be careful during drive on impossible tracks. If any singlemistake happens then you will face huge destruction. This realimpossible monster game 2017 is a dangerous task for you to driveon difficult curvy ramp track that are on sky high. In this realmonster truck impossible games, drive safely on curvy zigzag uphillmountain impossible tracks and keep in mind don't crush or damagedyour monster truck otherwise level will be failed. 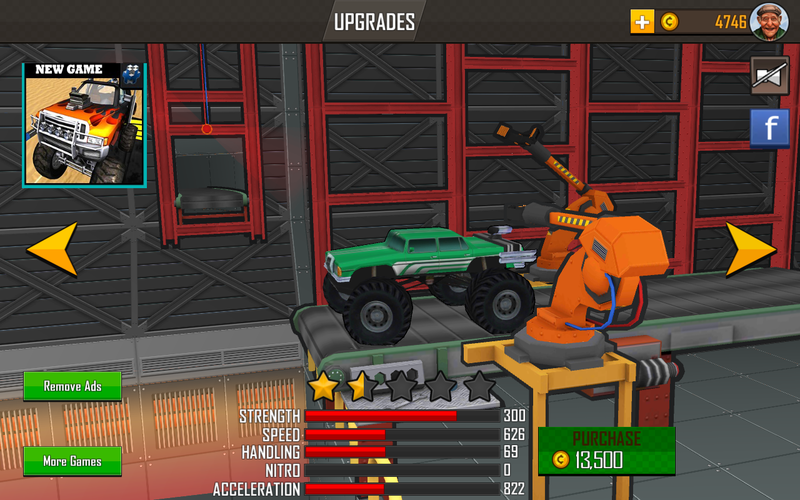 This crazymonster truck stunt legend 3d game gives you in-app to unlock newtracks and to remove ads. In this monster truck stunt game 2017game, we will give you a golden chance to drive real monster truckdestruction on big height ramp impossible tracks. These realmonster truck nitro impossible games will give you friendly userinterface. In the past time you might have played many new monstertruck stunt games 2017, but this heavy duty monster truck isdifferent from those games. In this real monster truck impossibletrack free game, we will give you sensitive touch display brake andaccelerator pedal icons. These new mmx hill climb monster truckgames will give you everything in one platform. You will drive yourbest new offroad monster truck on mid-air ramp track that are skyhigh. These modern impossible track driving monster games will alsogive you tilt screen option. Come and download this real monstertruck 3d: monster truck games. 3D Grand Monster Truck Stunts DriverFeatures: • Mid-air monster truck tracks • Monster truck zigzagtracks on big height • Featuring new 4x4 monster truck 3d graphics• Endless journey It's free to play so download this extremeimpossible track monster truck simulator game.